People on the east coast are still recovering from Sandy. Many Long Islanders are still without power and a friend of mine just got her power back on Saturday. Other friends are staying with their children in temporary housing while their home is gutted and restored. Some families are mourning loved ones lost in the storm as they try to rebuild their homes and their lives. As we all recover from this "Superstorm," it is hard to believe that "Superstorms," like Sandy, are going to become more and more prevalent. But we need to believe it. We need to accept the fact that human-caused climate change has heated up the oceans, making storms more and more powerful. 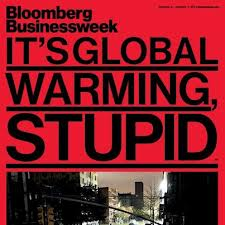 Even Bloomberg Businessweek ran a cover story entitled, "It's Global Warming, Stupid." As we all share our personal Sandy experiences, let us also open up the discussion of climate change and what can be done about it. While the possible solutions seem the purview of scientists and political talk shows, they would also make a great topic for students learning to write argument. While you consider your Common Core lesson planning, consider this very relevant issue.